What is fate? What is destiny? Personally, I believe it is that little force that is somehow responsible for brining us to certain crossroads. It is the decision we make at these pivotal moments that shape the outcome aka destiny. What has this to do with a timepiece? Well, a couple of years ago, when the Deep Sea Sea Dweller (DSSD) finally hit the local market, it was sold at a premium over the list price at the local authorized distributors. I was offered a 'G' series at a discounted price (off the premium) but turned it down as I was getting a PAM 320 then. Looking at the current price of the DSSD, I have been kicking myself ever since. My opportunity at redemption came last year, when fate came knocking on my door once more. Well, in a way. A good old buddy called me one weekend to inquire about the price of a brand new Rolex Submariner (no date). He explained that his father had won one at a lucky draw recently but did not want to sell it. A local pawnshop had offered SGD7,500 for it. I told him to send it over within the hour. I took care of its destiny. This is the latest update of probably on of the coronet's most iconic piece. The dial is nicely laid out and not overly cluttered. I particularly like the 4 lines of text at the bottom. It gives the watch a more balanced and professional facade. In all honesty, the no-date model has never been my favourite. However, I've started to appreciate this no-date variant. As this is not a huge watch, the absence of the cyclops date window makes the watch look bigger. Unlike the previous offering, this number is fitted with a uni-directional ceramic (Cerachrom, in Rolex-speak) bezel, with the markers and graduations coated in platinum. he bezel is firm but not tight and is easy to turn. It takes 60 clicks to complete a full revolution. The clicks are pleasantly muted but assuring. This latest rendition is equipped with Rolex's 3130 calibre and is ensconced within the manufacturer's famed oyster case, clamping it safely shut. Pretty much how its namesake mollusc would its precious pearl. The triplock crown is really tight. It requires more effort to unscrew and screw it back into position. The "O-ring" is also visible when the crown is unlocked. this ensures its water resistant capabilities, which incidentally, is depth-rated up to 300 metres. Now a little more on the calibre 3130. Firstly, like all it's siblings from the house of the coronet, it is COSC certified. Secondly, it is fitted with their latest crowning glory, the Parachrom hairspring, which is ten times more shock resistant to shocks than conventional hairsprings. Furthermore, the Parachrom hairspring is blessed with anti-magnetic capabilities. The one important design coup that Rolex scored has to be with the broader lug shoulders on this latest example. Unlike the previous model, the enlarged lug shoulders make the watch look larger than its actual 40mm girth. However, the relatively narrow lug width (20m) exposes the reality. Truth be told, I had intended to give this watch to the missus but thanks to the lugs, the watch is a tad too big for her tiny wrist. 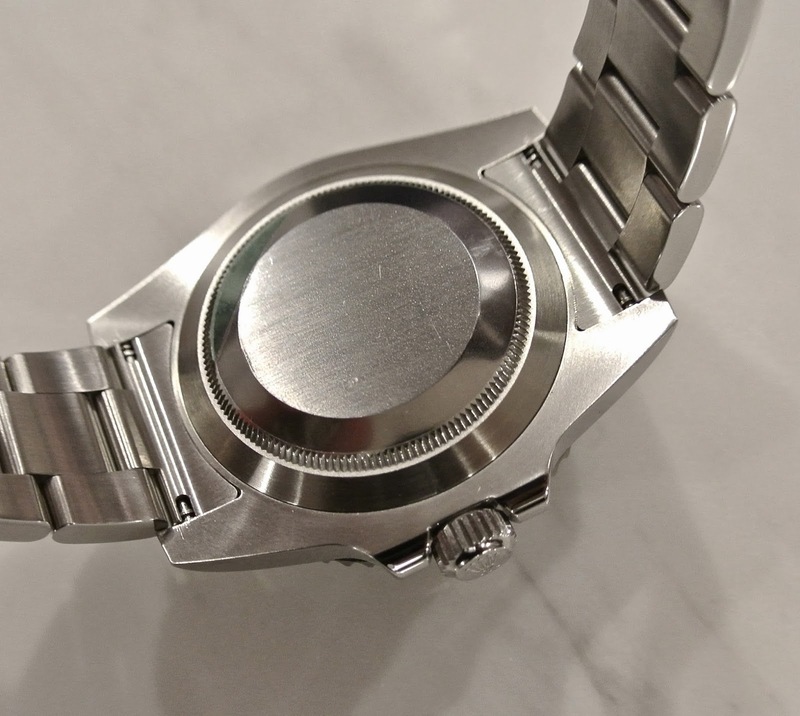 The case is slim except for the caseback protrusion. I must admit I am rather taken aback by the sheer beauty of the watch's profile. Neatness, completeness, attention to detail - these adjectives come to mind whenever I look at the profile of the case. The bezel, form this perspective is a piece of art. However, the only eyesore is the upside down crown logo on the crown in the "locked" position. This is not a problem but just an eyesore. However, I reckon the least Rolex could do is to at least get this right for the price they are charging. The satin brushed oyster bracelet is sturdily finished and feels solidly hefty. at the end of the tapered bracelet is Rolex's folding clasp which features its Glidelock system. This easy to use system allows the clasp size to be adjusted by sliding one side of the bracelet along the clasp enclosure, before locking it at the desired position. This makes fitting over wet suits a breeze. The caseback is characteristically Rolex, which essentially means it's as spartan as they come. No inscription, absolutely nothing. A blank, boring rear. For a watch that commands a heavy price tag, the least that Rolex should do is brighten the caseback a little. The watch looks surprisingly okay on my wrist. This, in my opinion, is due to the large lug shoulders. The only obvious tell tale sign that this is actually a rather small watch is the minute sections of exposed wrist that is usually covered by my other watches. On the lume front, Rolex never fails to excite. The bluish/ turquoise lume is updatedly avant-garde. I can't help but think that I am staring at the poster of a sci-fi movie. Hey! Hang on, if memory serves me well, didn't Sharon Stone had a Submariner prominently on her wrist in Sphere, while the rest of the cast donned nondescript black numbers? Anyway, I digress. Though the Sub has never been high on my list, I have really grown to like it. This broad shouldered beast is perfectly balanced, aesthetically, and bears handsome build and features. However, it will be great if the case is a tad bigger at 42mm. then again, considering I got this at a relative bargain, I shall thank fate for allowing me to decide my destiny. Movement : Rolex Calibre 3130. Power Reserve : +/- 50 hours. - Broad lug shoulders creating the illusion of a big watch. - Simple and classy design. - Use of shock and magnetic resistant hairspring (Parachrom). - Tight Triplock crown ensuring a tight seal (water resistance). - Firm, easy to operate uni-diectional bezel. - Beautiful updated lume colour. - Solidly built and excellently finished. - Relatively well priced for an in-house movement and a very well finished case. - Easy bracelet adjustment through the Glidelock system. - A tad too small at 40mm. - Overly spartan Rolex "signature" caseback. - Logo on crown in upside down position when locked.